The 10th Australian Pacific Vertiflite Conference on Helicopter Technology 2019 is being organized jointly by the VFS Australia, India and Singapore Chapters during the Australian International Airshow week, providing delegates the opportunity to visit the airshow alongside the conference. The conference will take place on February 27-28 at the Swanston Academic Building on RMIT University campus, preceded by an optional February 26th workshop on wind energy presented by Dr. Lakshmi Sankar from the Georgia Institute of Technology. It continues on March 1 at the airshow, taking place at Avalon Airport at Geelong. 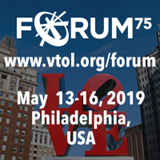 The conference will focus on the status of future vertical lift advancements covering design, development, operation and support, both manned and unmanned.